I have also made it thru (FINALLY) clue 2 on the Carolina Christmas mystery. 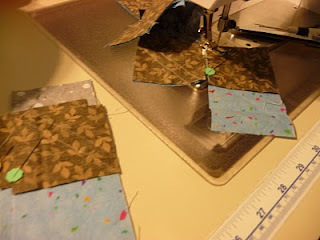 I have even cut part of clue 3 and started sewing. 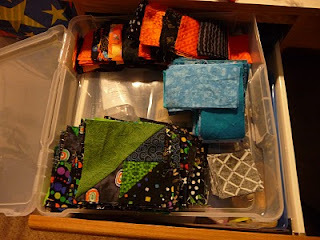 I will be interested to see if I will use all these units in ONE quilt, or divide them up and make 2 smaller ones. 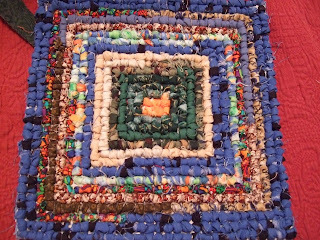 I like a quilt that has places for your eye to 'rest'. If they are too busy, my eye just glances over the whole thing and never stops to take a good look. I have visions of using blocks in the middle with a large inner border..then more blocks around the edge...Looks like I will be moving these around my design wall for a while to come! Our house guests (we HOPE) in March for Spring Training baseball, will eyeing these. My design wall is in there! Hope they bring sunglasses to sleep in..the brights might wake them up! Love your Celtic knots...where did you get that design...love it. Thanks for the kind words about my quilts... I have only been longarming for about 14 months.... and still learning...but love freehand stuff. I love your Fire quilt..... Wow.